Wendy's was also pretty creative in the marketing department as well. Before Dave became the spokesman and created over 800 ads featuring himself, the company took some risks to get noticed in the burger wars. Let's look at two of these ads. One ad that raised a few eyebrows was an ad that was set in Soviet era, cold war Russia. The ad showed a Russian fashion show where the woman of generous proportions paraded in the same outfit with only quirky accessories to distinguish evening wear from day wear. This hammered home the point that Wendy's was all about choice, unlike what Russians had to endure supposedly. This was done before the age of political correctness and before the Berlin wall came down but it's interesting to note that an ad like this would never see the light of day today. The other ad gave birth to an 80s catch phrase from the most unlikely of sources. 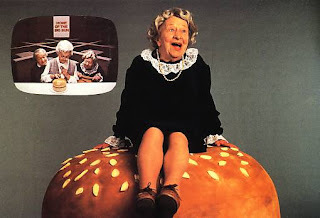 In 1984, Clara Peller ensured her place in the retro hall of fame with the phrase "Where's the beef?" The ad campaign, featuring the 80 year old, was one of the driving factors behind Wendy's turnaround and helped make the brand a force not to be ignored by the larger chains. Interesting side note on Clara, she was fired by Wendy's as their unofficial spokesperson after she made a commercial for a spaghetti sauce featuring the now famous phrase. 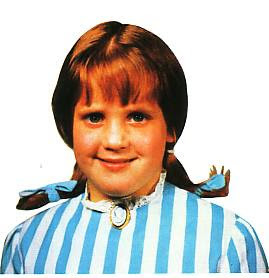 I hope she didn't spend all the Wendy's cash in one place or finding the beef would be alot harder.